NEW YORK, September 19, 2011 — Mongolia’s head of state made an impassioned case for universal human rights, justice, free media and clean government today, warning that his country’s vast mineral resources alone cannot guarantee its long term success as a nation. 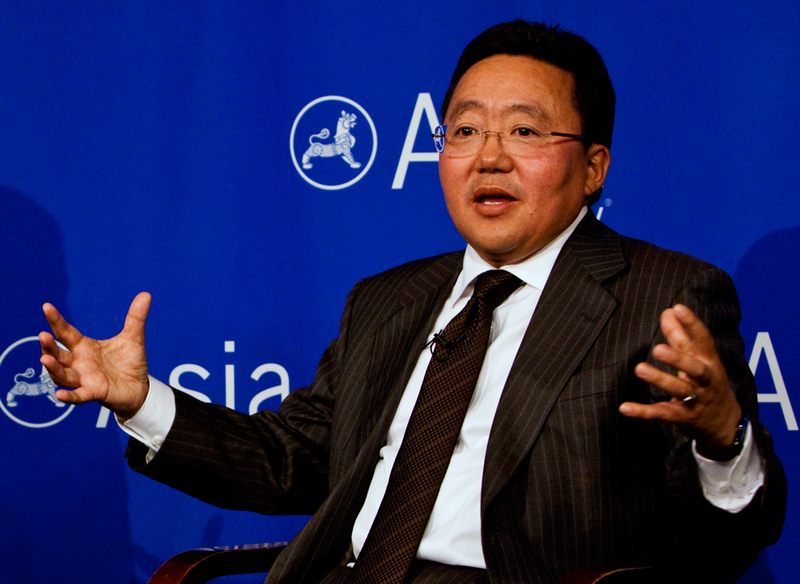 President Tsakhia Elbegdorj told an Asia Society audience that strong democratic values were not incompatible with Asian ways, economic development or its relations with neighboring giants, Russia and China. “Freedom, human rights, justice, the rule of law, those values can be enjoyed, even by the poor people, even by poor herdsman in Mongolia,” he said. “It can be enjoyed everywhere. Some people say that’s a political issue when you talk about human rights. I say it is universal. Some people say it is a cultural issue. I say it is universal. Elbegdorj, who is pushing hard for judicial reform in his country, said many democracies had failed after decades because of corruption. He pointed to escalating GDP figures and growing wealth thanks to the nation’s mineral wealth. “But we are very concerned about these mineral resources. If you have bad government, if you have corruption, if you have lot of money, the nation is in trouble, the country is in trouble,” Elbegdorj said. He listed Canada, Australia and Norway as successful resource-fueled economies because they are open and democratic. The president said Mongolia, for about 70 years “a socialist satellite” of the Soviet Union, is able to develop its democratic way while still maintaining good relations with Russia and China, which both have long land borders with it. He likened his nation to that of “a small freedom-loving pony between two big elephants." However, both Moscow and Beijing “understand our people’s choice and our way of life” and there were “great advantages” to have these two neighbors. Mongolia has benefitted directly from China’s fast growing economic boom. 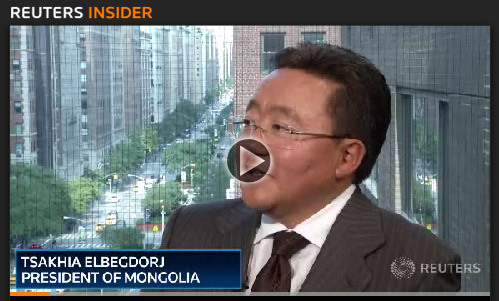 “Everything we have in Mongolia, they actually need in China. We also have great economic ties and traditions with Russia. We would like to continue that,” he said. However, Elbegdorj stressed the importance of finding other sources of investment and trade in what he said was a “third neighbor policy." “If we got more investment from a third neighbor, third partner, our pie would be bigger. And if that pie grows everyone would get that advantage. You know, it is good for everyone … it is also good for Russia and for China,” he said.